Or as I like to think of it, Choose-Your-Own-Adventure, F & K style! … Sit tight, folks. I promise I’ll explain. With the Siamsa Singers, I had the pleasure of visiting the Lester-Garland House in Trinity, Newfoundland. 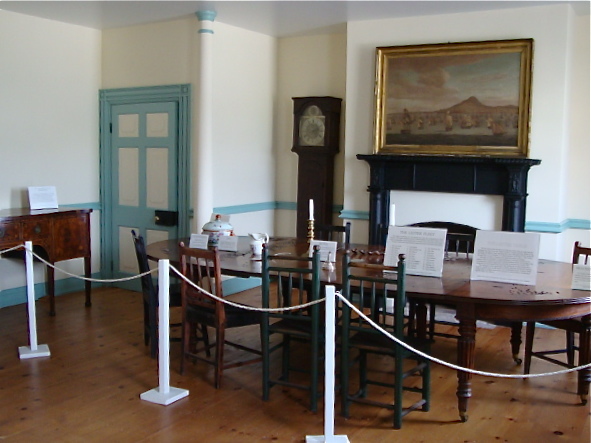 The LGH is owned and operated by the Trinity Historical Society, and it is a stunning reproduction of the grand Lester-Garland family home that once overlooked the harbour. We were treated to a tour not only of the house, but of the historic town, led by none other than the mayor of Trinity, Jim Miller! It was a lovely introduction to our three days in the Trinity area, and kicked off our evening’s concert with a particularly personal note (pun entirely intended). The dining room of the LGH is probably the most impressive room, with beautiful Georgian and Regency furnishings, which are original to the house and the LG family. They were collected by the historical society when they re-built the house. 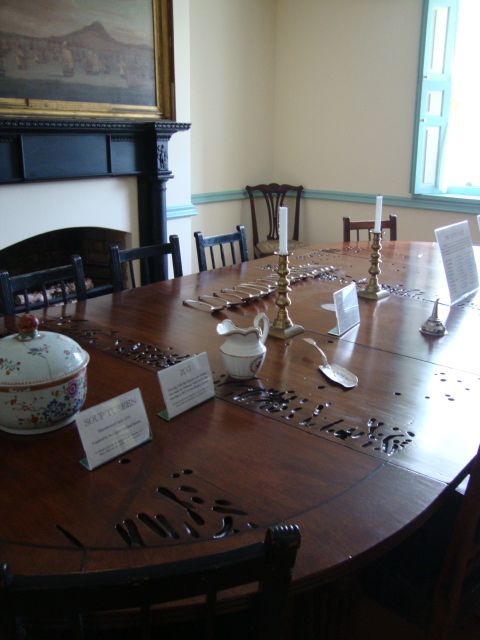 I loved the imposing dining table, whose top was actually made from reclaimed driftwood! The LG family was eco before it was cool. Sea worms were responsible for the burrowed markings on the top. I will admit to wondering if Mayor Jim would turn his back long enough for me to smuggle out that table. It’s a bit big to fit under my coat, but I could have made it work. 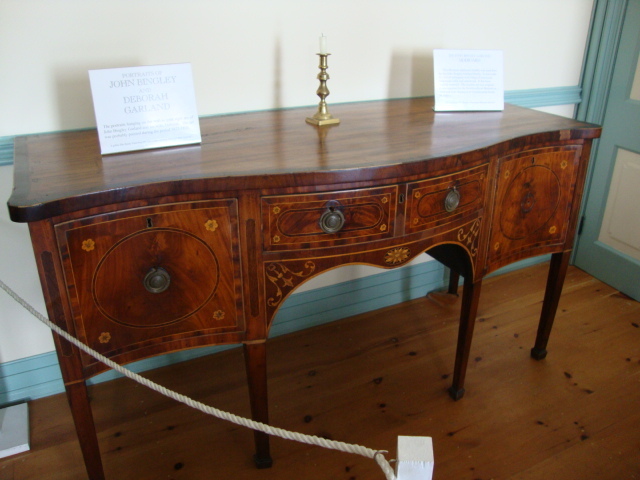 This sideboard was the piece de resistance of the room. The inlay work is so beautiful and the quality of the craftsmanship is unparalleled. Since I couldn’t abscond with the furniture, I had to settle for re-creating this room at home: a sort of “Lester-Garland Dining Room 2.0”. 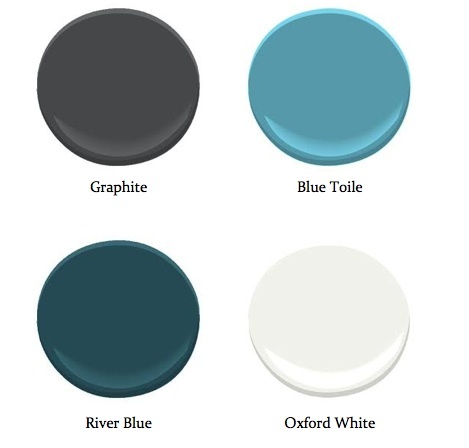 I drew from the Ben Moore colour gallery to pick four colours inspired by the walls, trim, fireplace, and dining chairs. I wanted the re-imagined dining room to feel fresh and contemporary, but still in keeping with the traditional style of the LGH. 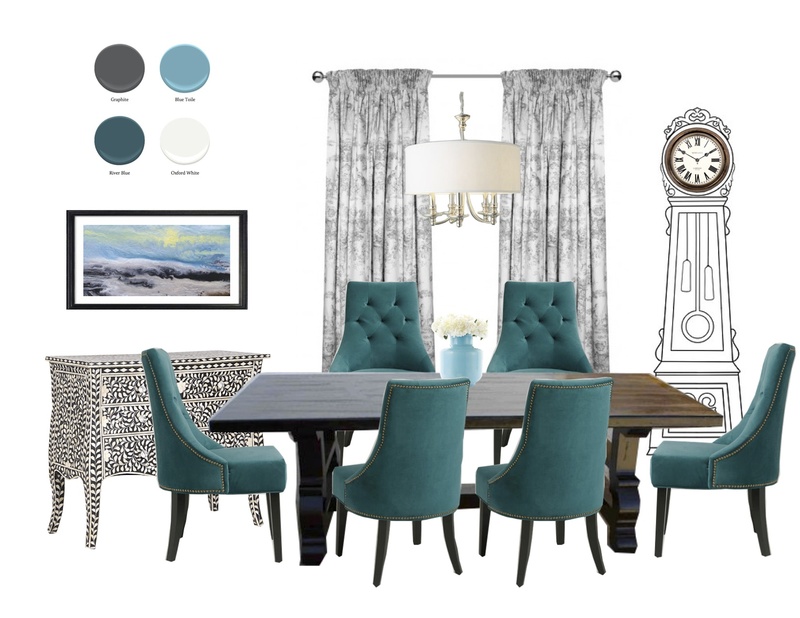 I kept some features more traditional, like the chandelier, table, and toile curtains, and modernized other elements. The grandfather clock is actually a decal from Ikea with a clock face, which I thought was a whimsical play on the original dining room. The French dresser is my take on what the LG family would have in their home, were they decorating and working in the 21st century. As a shipping family, they would likely collect pieces from all over the world, so this inlaid dresser makes sense to me. Or will it be ending #2? You be the judge! Use this poll to choose your favourite dining room. I have my personal favourite, and I’ll share it with you when I reveal the winner of the poll! Don’t forget to vote for your favourite Lester-Garland Dining Room 2.0! I’d love to know more about your choice, so feel free to leave me a comment, too! Woohoo for ending number 1!!!! Hahaha Stacey! Thanks for voting! That table is such a spectacular piece. Sometimes we like to think creativity only belongs to the current generation (yeah right!). I vote for ending #1! Thanks for letting me play along. I voted for number 1. But both are really lovely . The inspiration for it all is wonderful too. Thank you for sharing your sweet blog at the Thursday Favorite Things Blog hop. I look forward to our bloggy friendship and I hope to see you join in the fun often. Hugs!!! Thanks, Katherine! I’m so glad you liked my re-imagined dining room. I’m looking forward to reading more on your blog, too.